One of the hardest foods for me to resist at fairs, carnivals, and outdoor concerts is candied nuts. The smell of them lure me in and I can’t say no. My favorite nut, the pecan, is also my favorite candied nut. I like it when nuts are not just sweet when candied, but also spicy, so when I make them at home, I mix in a little cayenne to give it a kick. 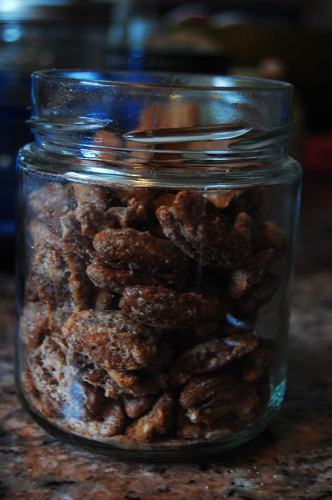 Candied pecans are a malleable food because they can be served alone as a snack or used as a topping in salads, on top of soups, or with a little vanilla ice cream. They have a shelf life of a few weeks, so you can make a batch and then dole them out as needed, which is something I always appreciate. They’re like the bacon bits of sweet toppings. Candying nuts is pretty easy. You want to moisten the nuts so that the sugar and spice can stick, so you dip them in frothed egg whites first, and then in the dry mix. 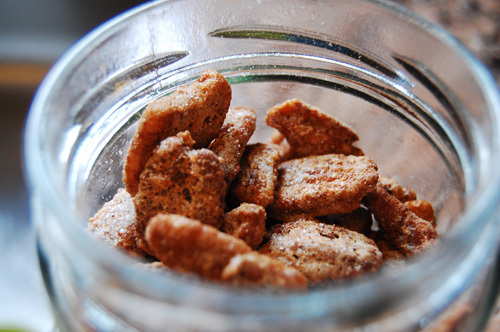 For my dry mix I used brown sugar, white sugar, cinnamon, cayenne, red pepper, and nutmeg. My main flavor makers were cayenne and cinnamon, but I added the other flavors to make a complete taste. After I baked them I tossed them again in more sugar and spice and then let them cool. This makes sure that there is a crusty sugar layer on the outside. The spice is subtle and the overall experience is wonderful- crunchy, chewy, sweet, and spicy. 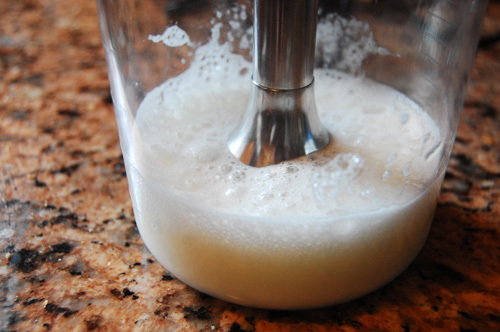 Use a whisk, mixer, or immersion blender to froth your egg whites. Add vanilla extract. Add the pecans and coat entirely. In a separate bowl, mix white sugar and spices. Split in half and set one half inside. To the other half add brown sugar. Dip the pecans in the brown sugar mix and place on a wax paper covered baking sheet. 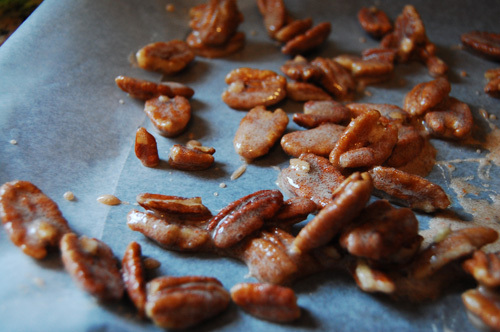 Bake your pecans in a 350 oven for 20 minutes. When they’re done, toss them in the remaining sugar mix and place them on a rack to cool. I made these to go with homemade peach ice-cream and they were a huge hit!! thanks so much for the recipe and fun blog!